Founded the Andre Agassi Charitable Foundation. Agassi won the ATP Arthur Ashe Humanitarian award for his efforts helping disadvantaged youth in LA. In 1997, Andre donated funding to Child Haven for a six-room classroom building now named the Agassi Center for Education. His foundation provided $720,000 to assist in the building of the Andre Agassi Cottage for Medically Fragile Children, a facility that accommodates developmentally delayed or handicapped children and children quarantined for infectious diseases. In 2001, Agassi opened up Andre Agassi College Preparatory Academy in Las Vegas, a tuition-free charter school for at-risk children in the area. 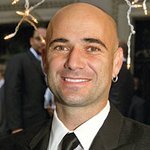 In 2007, Agassi joined with Muhammad Ali, Lance Armstrong, Warrick Dunn, Jeff Gordon, Mia Hamm, Tony Hawk, Andrea Jaeger, Jackie Joyner-Kersee, Mario Lemieux, Alonzo Mourning and Cal Ripken, Jr. to found Athletes For Hope, a charitable organization which helps professional athletes get involved in charitable causes. Google trends for "Andre Agassi"
We don't have any videos related to Andre Agassi.